Even though the hometown coffee giant is popular in the U.S. — and particularly in Seattle — data show that New Englanders are more hooked on their local chain than we are on Starbucks. Of all the East Coast-West Coast rivalries, there’s one where Seattle plays a front-and-center role — naturally, it involves coffee. I’m talking about Starbucks vs. Dunkin’ Donuts. Between them, the two chains control about 60 percent of the U.S. coffee market, with Starbucks dominating on the West Coast and Dunkin’ Donuts much of the East. While Starbucks is well ahead of its Massachusetts-based competitor in terms of market share, Dunkin’ Donuts may be winning the war on another front — namely, hometown love. New market data show that New Englanders are more hooked on their local chain than we Seattleites are on Starbucks. Don’t get me wrong. Starbucks is extremely popular around here. More than one in three adults in our metro area say they’ve patronized the coffee giant within the past 30 days, according to survey data from market research firm Nielsen. That ranks Seattle No. 1. when it comes to Starbucks’ market penetration. Impressive, until you take a look at Dunkin’ Donuts’ numbers. It does even better on its home turf — a lot better. 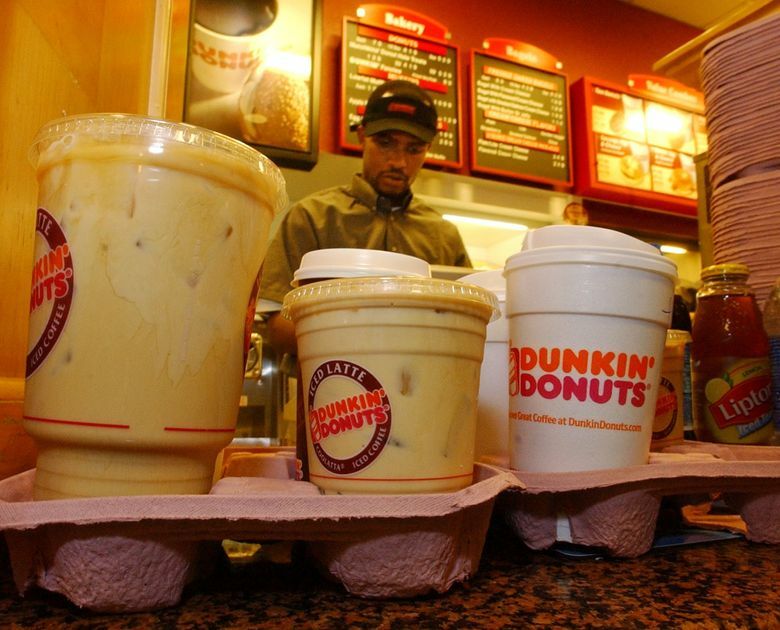 In Boston, not far from where the chain is headquartered, about 47 percent of adults say they’ve patronized a Dunkin’ Donuts in the past 30 days. Numbers are even higher in nearby Manchester, N.H., where more than half the population frequents the chain. New Englanders seem to have an almost unconditional love for their Dunkin. The chain has a distinctly local feel to Bostonians, despite the fact that it’s now spread to 41 states and 36 countries — folks just look at that as a hometown-kid-makes-good story. Here in Seattle, not everybody shares that same sense of regional pride in Starbucks. In fact, many local coffee purists would never set foot in one, favoring independent cafes over a massive corporation. They might begrudgingly credit Starbucks, founded in Pike Place Market in 1971, with spearheading Seattle’s world-famous coffee scene. But that hardly makes up for unleashing pumpkin spice madness upon the world — the flavor is now found in everything from vodka to dog treats. Another common complaint is that Starbucks’ beans have a bitter or burnt taste. Then, of course, there’s the Sonics. Former Starbucks CEO Howard Schultz sold Seattle’s NBA franchise in 2006 to an investment group from Oklahoma City, to which the team eventually departed. We’ve been unsuccessful so far in securing a new basketball team, and some local sports fans still hold a grudge. Perhaps it’s also a matter of economics. Starbucks is more expensive, the branding more upscale and hip. Dunkin’ Donuts markets itself more as the “Average Joe” coffee shop. Its presence is stronger in suburban areas, while Starbucks is more heavily clustered in cities. This distinction between the two coffee titans is borne out by the market research. According to Nielsen, Starbucks patrons have a higher median household income and are more likely to be college educated. They’re also younger. Someone who frequents Starbucks is more likely to be under 30 than 55 or older — the exact opposite of Dunkin’s demographics. While Starbucks is ubiquitous in major cities around the country, the Nielsen data show that the West Coast remains the company’s stronghold. Tacoma is right behind Seattle in the rankings. After that, it’s nearly all California. San Diego, where about 30 percent of adults say they’ve patronized a Starbucks, ranks No. 3. Denver is also in the mix, in seventh place, while Portland ranks just outside the top 10. Starbucks does go head-to-head with Dunkin in its own backyard, with close to 300 locations in Massachusetts. But while the green siren be can seen all over the Boston area, only about 15 percent of folks say they’ve patronized a Starbucks in the past 30 days, according to Nielsen. That ranks Boston below Starbucks’ average for U.S. metros. There’s no turf war between the companies in Seattle. Although at one point there were 10 Dunkin’ Donuts locations around this area, but since 2002, the chain has had no stores in Washington. That could change though. In January, Dunkin’ Donuts announced an ambitious plan to open 9,000 new stores in the U.S., doubling its current footprint. Starbucks has about 14,000 locations nationally, with plans for 3,400 more in the U.S. by 2021. Nielsen interviewed about 400,000 adults age 18 and over in more than 10o metro areas between August 2015 and November 2017. Nearly 4,600 were interviewed in the Seattle metro, which includes King and Snohomish counties.